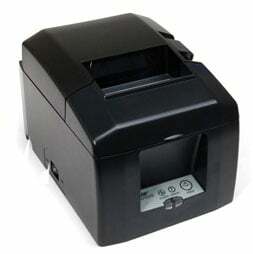 Star TSP650 Series: TSP650ii - Thermal, Auto-cutter, Ethernet Interface. Includes Power supply. Color: Dark gray. Also known as TSP654IIE3-24 GRY US. With its "drop in and print" paperloading, small footprint and reliable guillotine cutter, the TSP650II is a welcomed addition to POS systems. The TSP650II features the best of both worlds by coupling the comfort of legacy products with the speed and connection demanded today in hospitality environments. The TSP650II features low cost and high performance combined with the ability to work effectively in any environment. Out of the box, the TSP650II can easily be configured. New vertical mounting stand and splash proof cover options help make it one of the most reliable POS printers in the world. The Star 39449770 is also known as Star Micronics	STA-39449770	.